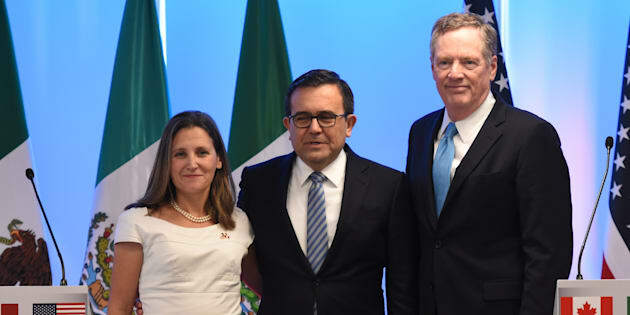 Minister of Foreign Affairs of Canada Chrystia Freeland is seen with Mexico's Secretary of Economy Ildefonso Guajardo Villarreal and U.S. Trade Representative Robert Lighthizer in Mexico City on Sept. 5, 2017. OTTAWA — NAFTA negotiators appear to have adopted the lament of the White Rabbit: "The hurrier I go, the behinder I get." Battalions of negotiators for Canada, Mexico and the United States have been working at a breakneck pace trying to reach agreement on a revamped North American free trade pact by the end of the year but so far they have little to show for it. "Yeah, well, we're moving at warp speed but we don't know whether we're going to get to a conclusion, that's the problem," he told the Centre for Strategic and International Studies in Washington. "We're running very quickly somewhere." But trade experts and stakeholders who've been following the negotiations closely say they've seen no progress on any of the thorny issues and no discernable headway, even on the simple things where all three countries should be in agreement. "I think it is important that we begin to see real engagement on some of the difficult issues," agreed Ted Alden, senior fellow at the Washington-based Centre on Foreign Relations. U.S. President Donald Trump speaks before a meeting with Egypt's President Abdel Fattah el-Sisi at the Palace Hotel during the 72nd United Nations General Assembly on Wednesday in New York City. "I think the sooner that happens, the better likelihood of a positive outcome. All that seems to have happened so far is they're sort of (saying), 'Here are the areas where we can check off the boxes' and they haven't even done that many of those." Canadian officials also say progress has in fact been made on the non-controversial issues, including the digital chapter, although they concede the tough files have yet to be broached in a serious way. Indeed, the U.S. has not even provided text spelling out its position in at least two contentious areas: rules of origin and agriculture. Minister of Foreign Affairs Chrystia Freeland is seen during the second round of NAFTA negotiations in Mexico City on Sept. 5, 2017. The Americans are expected to clarify their demand for more stringent rules of origin in the auto industry during the Ottawa round — which explains why Foreign Affairs Minister Chrystia Freeland is meeting with a roundtable of auto parts manufacturers on Friday, as well as having lunch with former Prime Minister Brian Mulroney and his team who negotiated the original Canada-U.S. free trade agreement. Currently, NAFTA stipulates that vehicles must have at least 62.5 per cent North American content to qualify for tariff-free passage across the three countries' borders. It's not clear so far whether the U.S. is looking to require a minimum amount of American content or whether it will insist on more stringent tracing of the origin of raw materials, particularly steel, that go into automobiles. In order to meet the deadline, both Alden and Clark said negotiators will likely have to settle for agreement in broad principle on some of the contentious areas, with details to be worked out later.